Hi, I noticed the gift guide heading on the front page. Do I need to add key words to listsings to get in teh guide? Is it a free guide for sellers? Sorry to be daft, Im sure Im the last person to have noticed this. Is there a place on Folksy I can go to read about it? 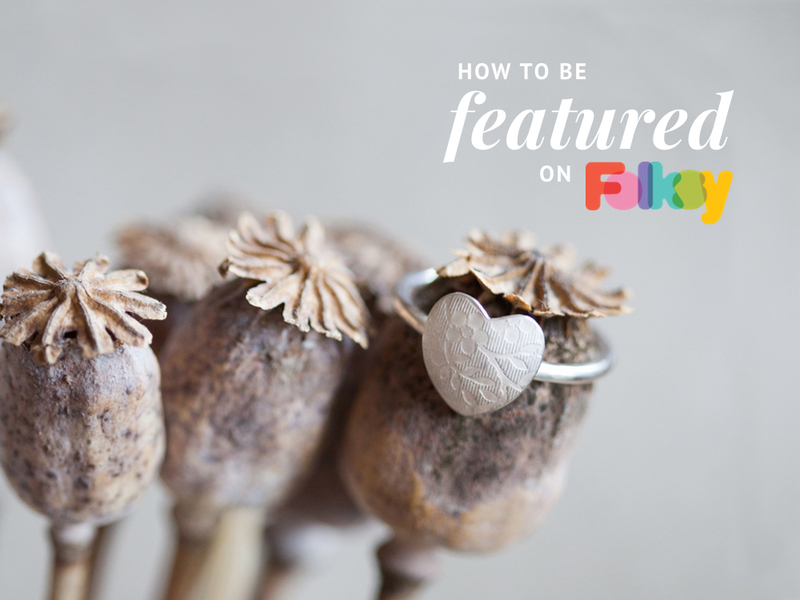 Items for the gift guide are chosen by Folksy. If you find the magic formula for getting included let me know the secret! I’ve managed to get an item in a gift guide and on a folksy pinterest board and the style of photography / quality of photography seems to make a difference as to whether or not you get in. have a look at the gift guides/ pinterest boards and see if your style matches theirs. Once you have mastered that then making them aware of the item probably helps as Teodora has found. I think a lot of it is to do with the item photographs. You wouldn’t think bird baths would be ‘trendy’, or ‘designer’ enough to get into the gift guides, but I’m in a few of them this year. I have made an effort to try and get a more contemporary feel to my photos, so maybe that’s what’s helped. I have tried so hard with my pictures and think maybe they are still not good enough to ever be in the gift guide or maybe its my items not sure. I did try to find a professional photographer to help but was just to expensive. I have followed all the advice on here with photography and have tried staging my pictures but it never works well for me. @PatchouliJewellery I didn’t know that my work had made it into the gift guide/ pinterest board so its worth having a look through as you might be there! I appear to have got it right with 2 out of 350 odd listings so my hit rate isn’t very good (but I have been featured in other blogs and pinterest boards so other people appear to like my work and photos). My partner is a serious hobby photographer (buildings and wildlife mainly) so I’ve had the benefit of his experience and him being super critical of my work and access to his camera kit. If we were to be super critical of your photos then on some of them the square crop that gets applied to thumb nails has caused bits to be chopped off (eg butterfly stamped bracelet or shell bracelet) whilst in others the exposure is off because of the contrast between the dark ish background and the highlights on the reflective silver (eg love heart bracelet or butterfly stamped pendant). The cropping issue can be fixed with picasa or similar however the exposure issues are much harder to solve and I’m still working on it. Both the bits that folksy have featured happen to be some of my copper work - much easier to get the right contast and exposure. Best suggestion is to try different colour backgrounds (different shades of white/ grey and beige) and some reflectors/ diffusers. Pieces of white card or crumpled silver foil smoothed over brown card make good cheap reflectors. I hope you find this helpful and good luck with the next attempt - your work is beautiful and would fit into some of the gift guides wonderfully. Hi Sasha thank you for your reply. With the thumbnails do you mean that part of the silver piece is missing sorry if I sound silly just not quite sure. I have looked at picasa but found it complicated I just use some basic thing that is on my laptop not the best at technology, but you can crop so I can retake those and try again in the new year when we actually get a dry day here in Wales (I take my pics outdoors with a light tent and I use white card I only have a basic camera) I see what you mean about the contrast so can try and work on that and maybe just use the lighter wood instead of the slate. @PatchouliJewellery - with the thumbnails I mean that either part of the silver is missing or very close to the edge making the picture look off centre. Have a look at bird bangle - part of the bangle has disappeared off the picture on the left hand side but there is a chunk of wood on the right - shifting the crop so that all the bangle was in the picture would make it much better. I always save both the original files that the camera took and the cropped versions with different names so if I need to recrop something I don’t need to retake the photo I can just go back to the original file (a habit I picked up from the other half). The lighter wood would probably be better for the contrast but if you look at the tear drop lace print earrings or bird stamped studs the whole image is under exposed (I normally take 3 versions of the same shot increasing the exposure each time so that one of them should be correct). Exposure can be tweeked in some of the photo manipulation software but you do need to be a bit careful when doing that the results can look terrible. Good luck with getting a non rainy day! Hi ok thanks thought that was what you meant have changed the ones I can for now and will try and improve the rest soon. I think I can change some of the things to help exposure on my little camera but remember trying and it never seemed to work that well will have to have another look.